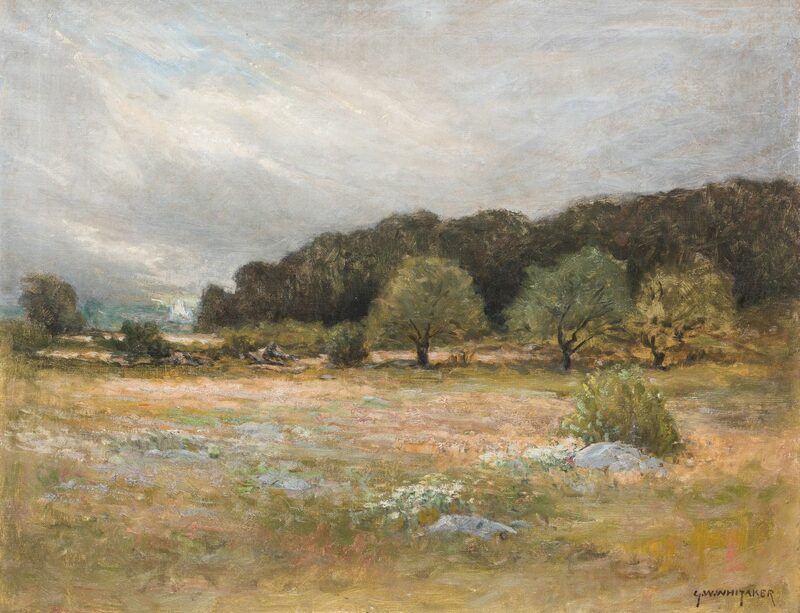 George William Whitaker (Rhode Island/New York/Massachusetts, 1841-1916) oil on canvas Barbizon School landscape depicting a sparse field with trees against a small range of mountains and an overcast sky. Signed, G. W. Whitaker, lower right. 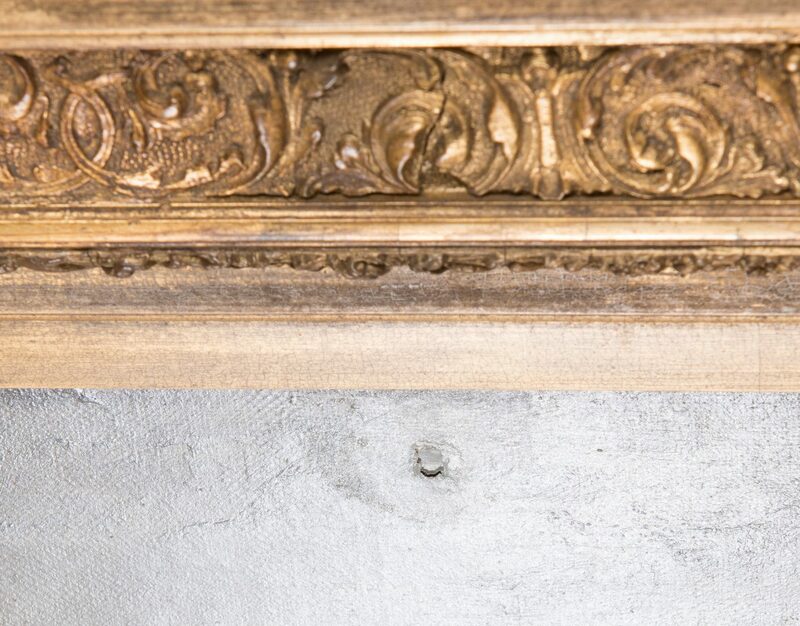 Housed in a decorative carved gilded frame. 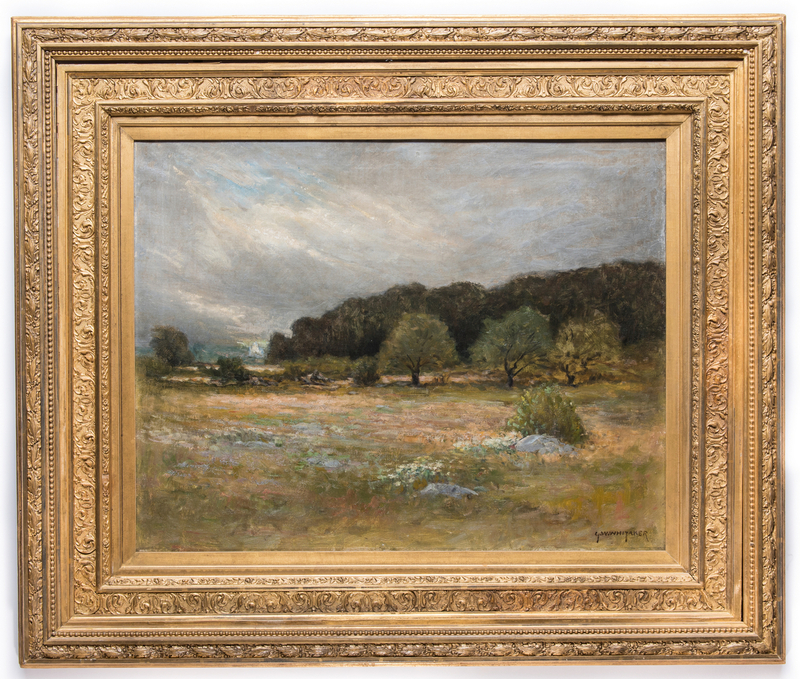 Sight – 21 1/2" H x 27 1/2" W. Framed – 34 /4" H x 40 1/4" W. American, late 19th/early 20th century. Provenance: Knoxville, TN estate. 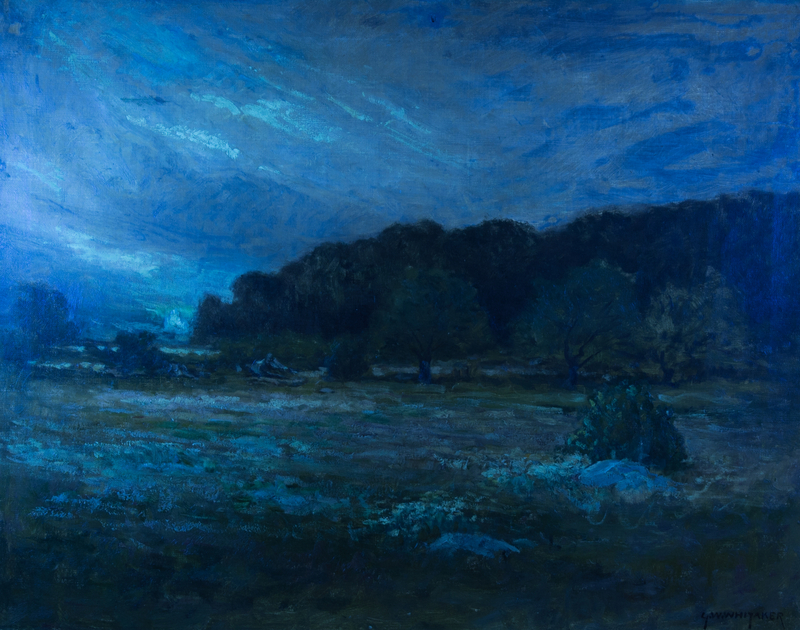 Biography (courtesy Bert Gallery): Born in Fall River, Massachusetts, George William Whitaker was orphaned at the age of two and taken in by his maternal relatives. His uncles taught him draughtsmanship and engraving in New York City, allowing him to join the family business. This move to New York proved pivotal for Whitaker. 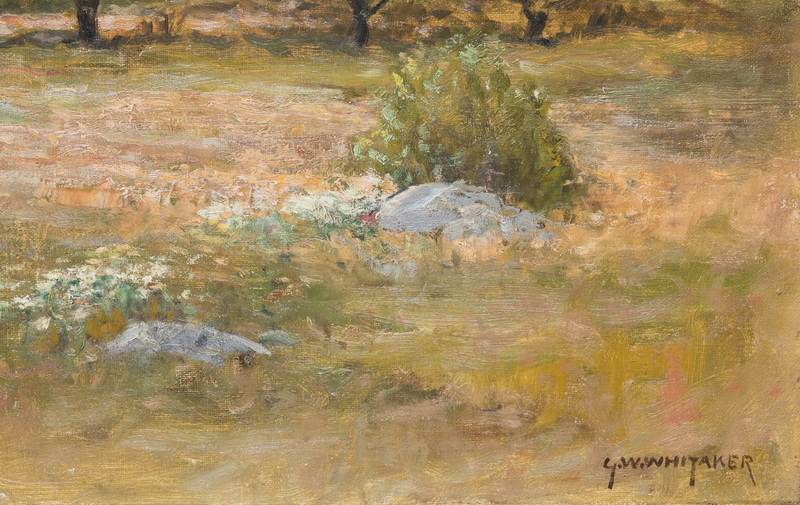 In New York, artists Alexander Wyant and George Inness noticed his talent. 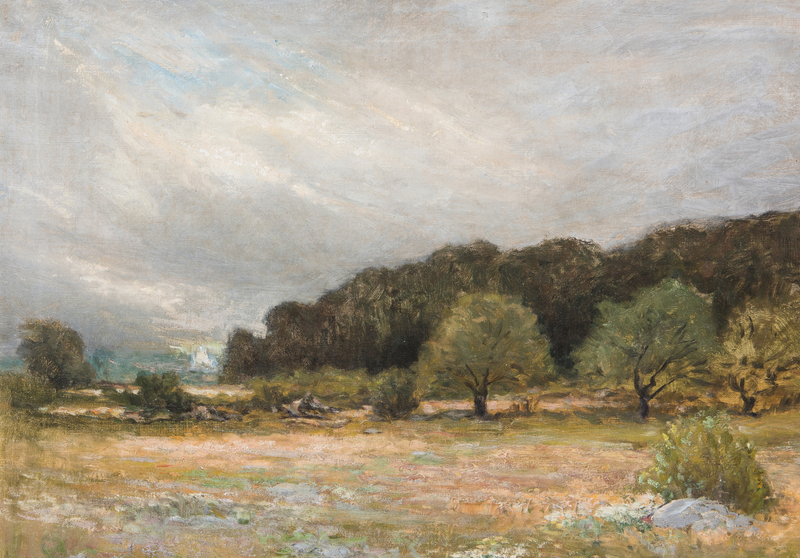 Through their influence, Whitaker went to study art in France at the Julian Academy under the artist De Paal. 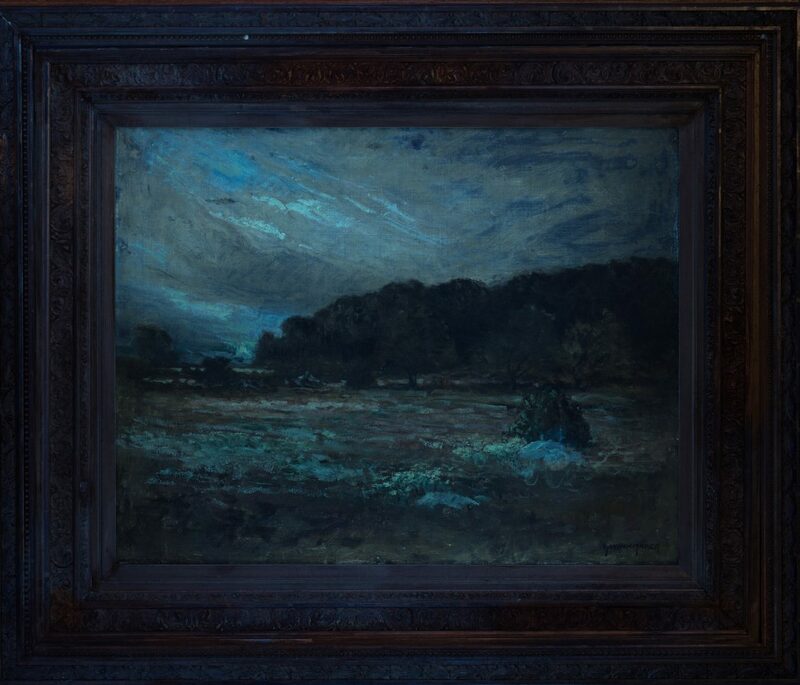 While in France, Whitaker was influenced by the Barbizon School of Art, which focused on rural subjects and darker palettes, a trend which remained evident in his art. 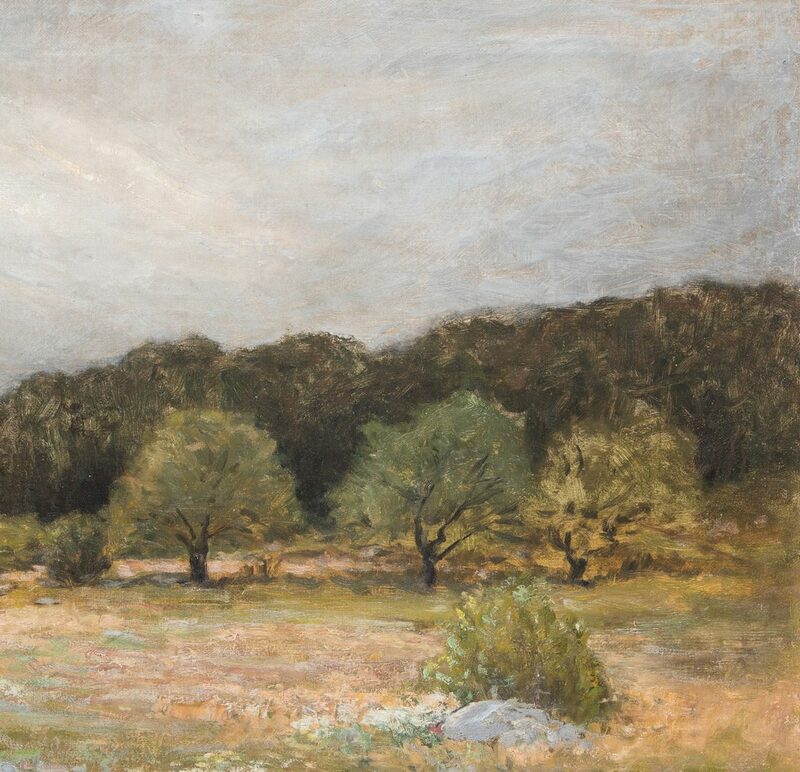 Returning from France to Providence, RI, Whitaker recognized the need to nurture art in Providence. 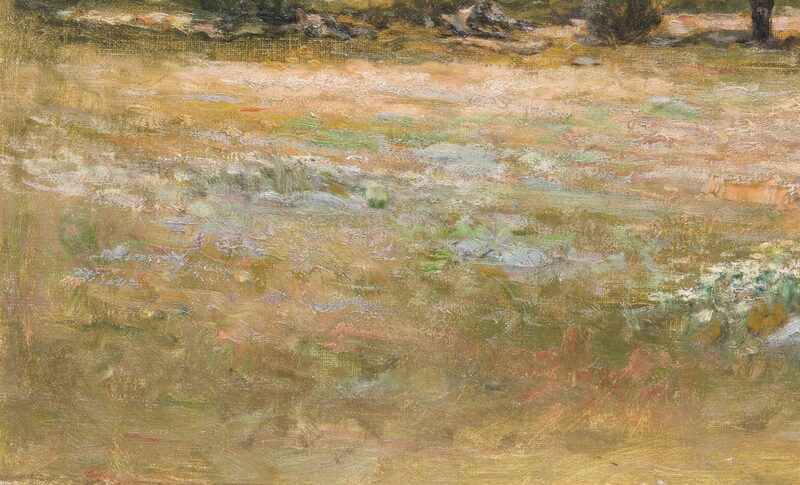 In 1880 along with E.M. Bannister and Charles Walter Stetson, Whitaker founded the Providence Art Club. 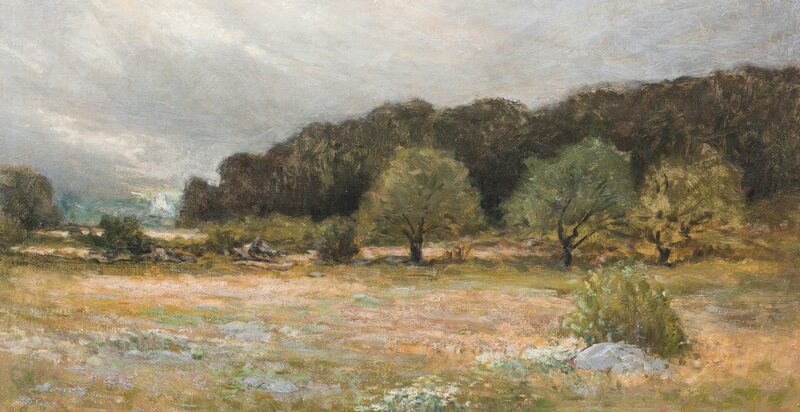 He also became the first oil painting teacher at the Rhode Island School of Design (1882-1885), bringing his knowledge of European art to the artists of the city. 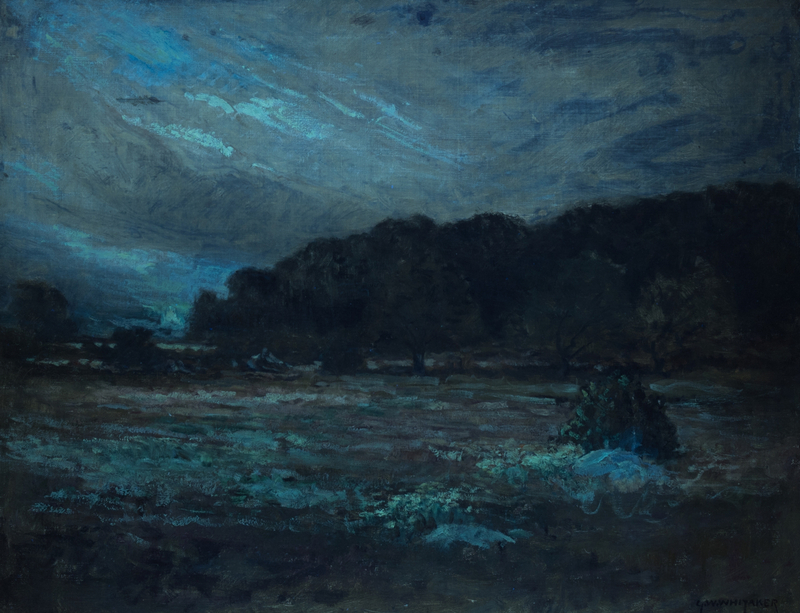 Whitaker also continued to produce paintings of the nature around him, keeping the dark tonality of his earlier work. CONDITION: Overall good condition. Painting has 1/4" dia. 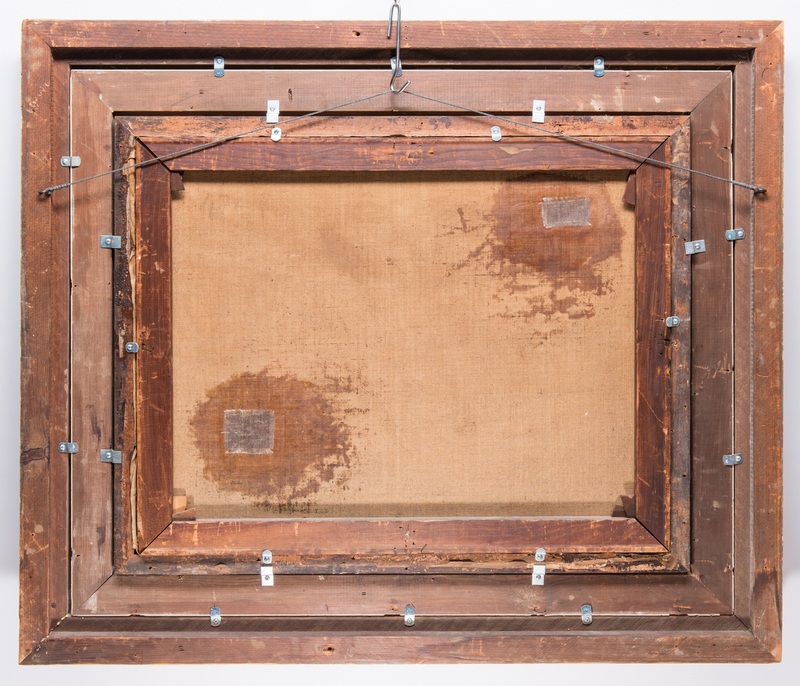 perforation top center of canvas with inpainting behind on stretcher. Two previous patch repairs visible en verso. Stretcher marks all sides of canvas. Rippling, top left and right of canvas. Frame has gap at top between inner and outer frame.